Image from Pennsylvania Game Commission website. According to the Pennsylvania Game Commission’s website, two controlled burns are set for tomorrow (Monday, November 16, 2015) in State Game Land No. 217 located southeast of Andreas in West Penn Township (Schuylkill County). 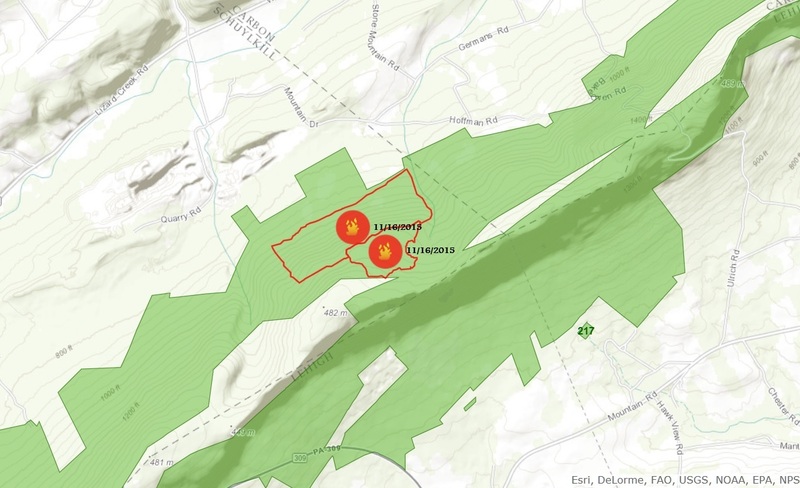 The burn areas, totaling about 52-acres, border the Carbon and Lehigh County line at the far eastern portion of Schuylkill County. The burn is weather permitting. According to Weather.com, Monday’s weather for Andreas calls for sunny skies, temperatures ranging from 35 to 65 degree Fahrenheit, and 6 MPH northwest winds. In addition to these two burns, four controlled burns are scheduled in the future for parts of State Game Land No. 141 on the Broad Mountain between Packer Township, Weatherly and Jim Thorpe. The date hasn’t been set yet and will only be done if time and weather permit. The controlled burns are part of 3,300 acres of scheduled prescribed fires. 5,000 acres were burned last year during controlled burns. Click HERE for a related press release. No prescribed burning will take place after November 20, since the statewide firearms bear season begins November 21, 2015. Click HERE to view and navigate the P.G.C.’s online interactive map of schedule control burns in Pennsylvania. The Pennsylvania Game Commission is using prescribed burns to improve forest habitat on State Game Lands throughout the Southeast Region. Prescribed burn area. Image via Google Maps. The majority of State Game Lands are forested, with oak species being a major component. As an oak forest begins to age, the new oak seedlings are outcompeted by other tree species (such as birch, maple and tulip poplar). The overall impact to the forest is a decline in the number of oak seedlings growing into mature trees and a change in the species composition of the forest. This decline in the number of oak seedlings is a problem because oak trees are extremely valuable to wildlife. Oak acorns have high nutritional value and are sought after as a fall food by a variety of birds and mammals as they prepare for the winter. While other trees may hold some value to wildlife, they don’t compare to the benefits derived from oak. Oak trees are very different from birch, maple and tulip poplar. Their bark is much thicker and their root systems are much deeper. Because of these fundamental differences, fire can be used to promote the growth of oak seedlings and reduce competition from other species. A very monitored, slow moving “prescribed burn” can be used to remove the black birch, red maple and tulip poplar seedlings from the forest understory. The fire will enable the oak seedlings, already present on the site, to sprout and grow without interference from surrounding vegetation. This will allow oak to remain the dominant species as this forest grows. Throughout Pennsylvania’s long history, oak trees have evolved with low intensity fires, a lot of them occurring naturally. Fires were intentionally set by native Americans for thousands of years to promote wild berries and improve game habitat. In the early part of the 20th century, public concern over wild fires led to the creation of the US Forest Service’s Smokey Bear campaign in 1944. Since then, wildfires have been all but eliminated from the state. This has not had a completely positive result. Because of the reduction of fires, Pennsylvania forests have changed and resulted in the gradual transition away from a forest that was once dominated by oak trees to a forest now dominated by red maple and black birch. In order to increase the number of oak trees on each site, the Game Commission attempts to mimic those earlier growing conditions by reintroducing fire, in a controlled manner, back into the forest ecosystem. The Game Commission has been using prescribed burns as a habitat management tool for more than ten years, burning thousands of acres, from grasslands to forests. Prescribed burns may be scheduled to occur much of the year depending on the weather and site conditions. All prescribed burns will be conducted and guided by all laws, standards and procedures of the Prescribed Burn Practices Act, as well as techniques learned from prescribed burns on other State Game Lands. The use of prescribed burns, sometimes referred to as a controlled burn, is very different from a “wildfire.” With a prescribed burn, safety is the first consideration in the process, from the planning through the implementation. The entire operation is overseen by a “Burn Boss.” The process for a prescribed burn begins with a detailed plan written by local field staff, approved by the Pennsylvania Game Commission and reviewed by other state agencies. Only after this has been accomplished, can the agency move forward with the prescribed burn. The timing of a burn is very weather dependent and takes into account the amount of moisture both in the ground and in the growing vegetation. The public will be able to find information on the exact burn window for all prescribed burns in the Southeast Region on the Game Commission website. In anticipation of the burn, a fire break is established around the entire area. Prior to the burn, all of the leaves and branches are removed from the fire break so that it will serve as a barrier between the prescribed burn and the surrounding forest. During the day of the prescribed burn, access to the site will be restricted and only people directly associated with the burn will be allowed access at or near the site. Trained staff will be on hand with numerous pieces of fire equipment and water resources. All necessary local fire and emergency personnel will be notified in advance. Prior to the start of the prescribed burn, a small, easily extinguished “test” burn will be conducted so that the Burn Boss can check the fire behavior and smoke dispersion patterns for the day. If the “test” fire burns within the pre-determined parameters, the prescribed burn will be allowed to continue. If it does not burn within those parameters, it will be called off for the day. If the Burn Boss approves the prescribed burn to proceed, an experienced crew of Game Commission and other natural resource agency personnel will use a regimented process to burn the site. As the fire begins to burn out, remaining areas with flames will be extinguished. After the prescribed burn is finished, there may still be small amounts of smoke present within the interior of the controlled burn area as some of the vegetative material burn out. This smoldering may last for several days after the area is burned. Flames will not be present though and there will be no danger to surrounding forest. The area will be monitored over the next 24 hours. A safe and effective prescribed burn is very dependent on both site and weather conditions. An anticipated burn window is established between time periods when optimum site and weather conditions could be present. As more exact weather and site conditions become known, the window for the burn is narrowed. At this point, the anticipated burn window is between October 5, 2015 and November 20, 2015. The public will be notified of the burn window status through the Game Commission website. 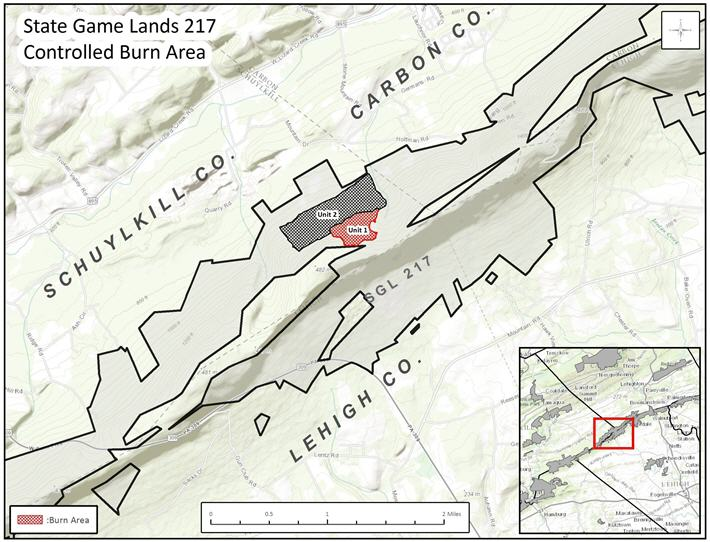 State Game Land 217, totaling 7,647 acres, is located in northern Lehigh, southern Carbon and southern Schuylkill counties. It contains a wide variety of habitat types within its borders and is home to a multitude of different wildlife species. Since over 97% of this State Game Lands is forested and 95% of that area consists of mixed oak forests, the use of a prescribed burn is very appropriate. The area to be treated with a prescribed burn totals 52 acres. It contains a mature oak stand that is dominated by chestnut oak. Forest fires were a common occurrence on this ridge in the early 1900’s, which led to the establishment of this oak stand. The combination of a lack of fire over the past 60 years and increased sunlight reaching the forest floor due to openings in the forest canopy, has led to a dense non-oak understory. The goal of this prescribed burn is to recreate the conditions that led to establishment of this aging oak forest. Currently there is a large amount of birch, sassafras, black gum and red maple seedlings that are overtopping and shading existing oak seedlings. If this condition continues, these oak seedlings will eventually be crowded out and die. A prescribed burn will remove a large number of these competing seedlings and allow the oak seedlings to grow and thrive. By removing some of the less desirable species, the prescribed burn not only reduces competition for the oaks, but it will also allow more sunlight to hit the forest floor. Sunlight is necessary for the acorns to sprout. Oak trees are extremely valuable to wildlife, so the failure of these acorns to germinate is a problem. A thick layer of accumulated leaves has also created an additional barrier on the forest floor, making it difficult for the acorn roots to become established in the soil. A fire will burn and remove much of this leaf layer. This is an aging oak stand that will undoubtedly have to deal with the loss of large oak trees in the coming years. It is vital that there are younger oak trees in the understory to replace these aging oaks. If oak seedlings are not available, this stand will eventually be replaced by red maple, birch, sassafras and black gum. The only effective way to maintain this invaluable oak component is with the use of a prescribed burn. Although the area may look a little different for a short time, the long and short-term effects will definitely benefit wildlife, the forest habitat and the users of State Game Lands. The blackened soil of the burn will remain in that condition for a short time, but will come alive with plants germinating from seeds exposed by the fire. Oak seedlings will begin to sprout very soon after a prescribed burn. Seeds produced from the overstory trees will germinate. Recent studies after State Game Lands fires also show reduction in ticks within the burned area. A prescribed burn of this intensity will not impact most of the over story trees. Most of the changes to the forest habitat will take place on the forest floor. Some species (red maple, black birch and tulip poplar) will be reduced from the site for a number of years. Within the following growing season, the site should be green and teeming with new plants – many of them rare plants that depend on fire to germinate and grow. Click HERE to view the press release or for more information.